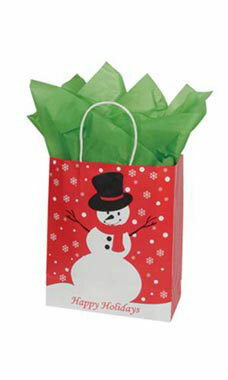 Medium Holiday Snowman Paper Shopping Bags will have your customers in the holiday spirit. Featuring bold red, white, and black shading and “Happy Holidays” this bag is truly a work of art that your customers will love carrying! Bags feature a white interior and twisted rope handles for easy carrying of special gifts! Sold in cases of 100 bags.